Landowners take part in an outdoor Extension Forestry workshop. Is your forest healthy? Can you enhance wildlife habitat and protect your land from wildfire? How do you harvest timber sustainably? Eastern Washington family forest owners can learn how to answer these questions at WSU Extension’s upcoming Coached Planning Short Course, starting Wednesday, Feb. 20, near Spokane, Wash.
Running through April 17, 2019, the weekly course is aimed at owners of small-scale family forests, from five to 500 acres. 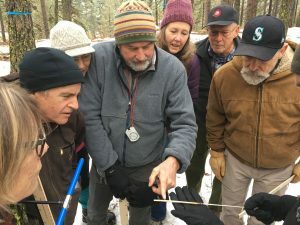 Led by WSU Extension and the Washington Department of Natural Resources, this award-winning program coaches landowners as they develop simple management plans for their forests. Course participants can certify their forests, earn reduced property taxes, and become eligible for cost-share assistance on practices such as thinning, pruning, slash disposal, reforestation, and wildlife habitat improvement. 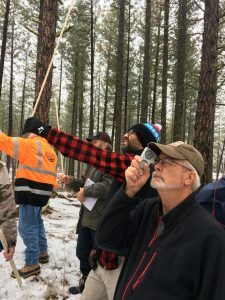 Covered topics include forest ecology, forest health, wildlife habitat improvement, thinning and pruning, wildfire protection, reforestation, responsible timber harvesting, forest soils and roads, riparian area management, fish habitat, cultural resources, special forest products, forest recreation, and more. The course fee is $100 per person, family or land parcel. Participation is limited to 20 registrants on a first-come, first-served basis. Classes will be held 6 to 9 p.m. Wednesdays at Spokane County Fire District 82, 12100 E. Palouse Highway, Valleyford, Wash. This course has not been held in Spokane County for five years, so landowners are encouraged to participate.